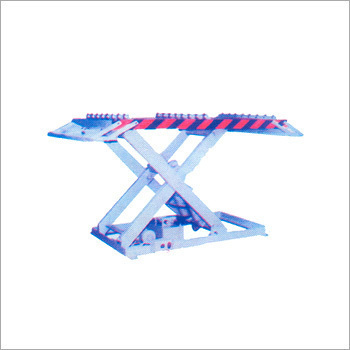 Scissor-Lift tables are one of very popular choice for material handling in Indian Industry. They are being used in many applications. A properly designed and equipped scissor lift enhances the logistic infrastructure, improving facility's competitiveness. They are available in wide ranges with various options and provide optimum solution for lifting awkward shaped objects to comfortable working heights with least worker fatigue and physical strain. Josts now offers scissor lift tables for various applications to suit customer needs and serves variety of application in industries. We are one of the renowned manufacturers and exporters of Industrial Scissor Lifts. These are a type of platform, which can usually only move vertically and used the linked as well as folding support in a criss-cross 'X' pattern, known as a pantograph. Our range achieves the upward motion by applying pressure to the outer side of the lowest set of supports, elongating the crossing pattern, and propelling the work platform vertically. This Industrial Scissor Lift also includes a platform that can have an extending 'bridge' to allow closer access to the work area (because of the inherent limits of vertical only movement). Looking for “Industrial Scissor Lift”?